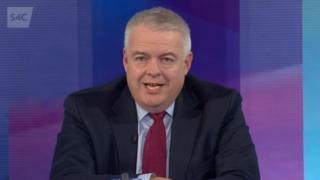 Former First Minister Carwyn Jones has called for a fresh referendum on Britain's EU membership. Before standing down in December, Mr Jones, the AM for Bridgend, argued that Labour should seek a general election first. But speaking S4C debate show Pawb a'i Farn on Thursday evening, Mr Jones said: "It makes sense to me settle the question now." Prime Minister Theresa May is seeking changes to the exit deal negotiated with the EU, amid opposition from Conservative MPs to the so-called Irish backstop. Mr Jones said: "To start with I said we had to respect the result, but at the moment we're looking at a no-deal Brexit, and nobody was arguing for that two years ago." He told the audience in Holyhead on Anglesey he favoured a two-question referendum, with one asking voters whether to leave or remain. A second question would then give a choice between Mrs May's deal or leaving without a deal. Conservative Mostyn Jones responded: "The answer was clear, to leave the EU, and that's what the Conservatives are working to achieve." Downing Street has been warned that dozens of normally loyal Conservative MPs could rebel against the government in a bid to prevent a no-deal Brexit. Leaders of a group of MPs comprising Leavers and Remainers say they may back alternatives if Mrs May's reworked deal cannot command a Commons majority. The government says "productive" talks in Brussels aimed at addressing MPs' concerns continue "urgently".